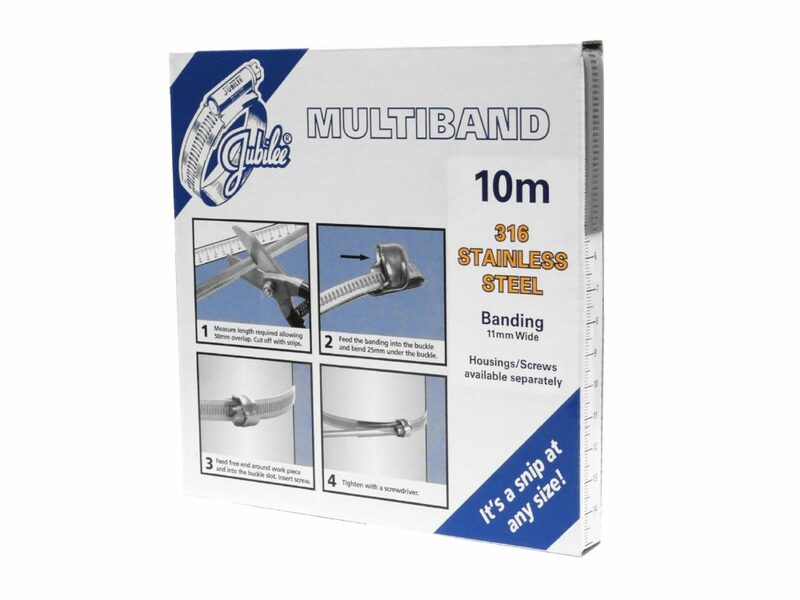 Multiband is Jubilee® Clips’ self-assembly, endless banding system which allows the user to make a clip to any size required and has been popular with our customers since its introduction in 2002. Following the acquisition of the manufacturer of Multiband, Elms Lightning Fasteners, in early 2013, numerous product improvements and new product ranges have been introduced to the market. Now, following regular requests from customers, we are pleased to be offering 316 (A4) grade stainless steel Multiband products to compliment our ranges of zinc protected mild steel and 304 (A2) grade stainless steel Multiband. The new products that have been introduced are 11mm width banding in both 10 metre and 30 metre packs as well as a 25 pack of Housings & Solid Screws. So why do we offer 316 (A4) grade stainless steel products? Basically, this material contains more nickel than our 304 (A2) material, as well as 2-3% molybdenum. This gives our Jubilee® hose clips and Jubilee® Multiband products much better levels of resistance to corrosion against chemicals such as acids and chlorides, making them better for industrial applications involving chemical processing. They also offers superior performance when exposed to sea water and direct salt spray, making them suitable for use in the marine industry. Due to 316 stainless steel’s non-reactive qualities, Jubilee® products made from this material can also be used in the manufacture of surgical instruments and other medical equipment, as well as pharmaceuticals where excessive metallic contamination must be avoided. We also currently offer our Original Range Jubilee® Clips and Superclamps in all 316 grade stainless steel, but keep watch in 2018 for new product ranges, as well as other products offering this high performing grade of stainless steel.